The rotten do-gooder face was still standing! Despite all of the damage Marauder had done, all the rules he had broken, and all the underhanded tricks he had pulled, Crusher just stood there with that sickly lopsided grin on his face. Marauder picked up a steel chair, spun and confronted Crusher as his seemingly unstoppable foe slowly stalked toward him. Marauder took a step forward and with all of his might waffled Crusher square in the head with the chair. Crusher stumbled backwards and fell to one knee with a look of stunned amazement on his face. No one could see it under his mask, but Marauder began to smile. Step into the squared circle for the ultimate showdown. • Expanded rules for high-flying, bone-crunching wrestling action, including how to use Heat to pull off dramatic moves. • A new Character Type and new Qualities and Drawbacks. • Weapons you can but aren't supposed to use in the ring. • Zombie aspects to drop kick any face or heel. 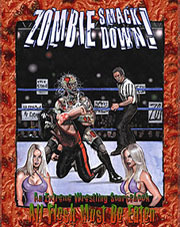 • Background on American, Mexican, and Japanese wrestling styles, and a Deadworld featuring each one. • A series of shorter wrestling zombie settings to lay the smackdown far and wide. • Plenty of new Archetypes from the wrestling world.